Note: On Monday, I usually post a new shopping series post, but as you can see, today’s post isn’t about shopping. In order to feature a store in the shopping series we must obtain permission from both the manager and the corporate headquarters. A lot of behind the scenes work goes into a single shopping series post. We were just granted permission to visit two of the three remaining stores in the series, so we will continue with a new post next week. Today, let’s turn our attention to prep day and smoothies! 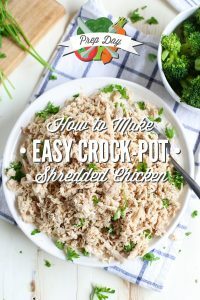 Some weeks I just don’t feel like heating up the oven and baking muffins, making soup, or cooking a whole chicken (even in the crock-pot). When those weeks hit, I remind myself about my reasons for prepping. 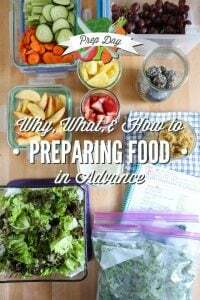 If I just can’t pull myself out of the prep day blues, I turn to easy foods that can be prepped without an oven: chopping fruits and vegetables, making fruit parfaits, washing greens, or blending smoothies. Even these “small” tasks can make a huge difference in our weekly schedule and the food we enjoy. 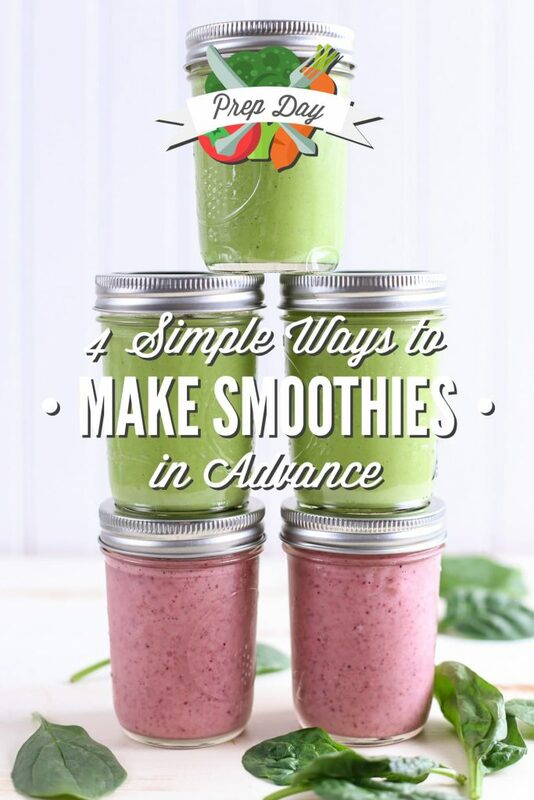 Even if you’re stretched for time, smoothies are super simple to prep in advance. A smoothie doesn’t require any cooking or dirtying dishes. Make-ahead smoothies are my ultimate answer to the famous question, “Mom/Honey, what do we have to eat around here?” I’m all about fostering independence when it comes to the real food choices available in our house, but when the only options available are ingredients versus edible food, this can be a hard task. With smoothies in the fridge or packaged as popsicles or push-up pops in the freezer, a breakfast/lunch/snack is always available. A smoothie alone won’t fill the hungry bellies in my family. For this reason, I usually pair a smoothie with an easy side: popcorn, cut veggie sticks, crackers, a homemade granola bar (made in advance), toast, a muffin (made in advance), or an egg. Smoothies are the perfect way to start the morning. By serving my family a smoothie first thing in the morning, I know everyone has been nourished with the best of the best. No matter what happens that day I know we have enjoyed a healthy dose of fruits, veggies, probiotics, and even sometimes nuts/seeds and chia or flax seeds. For years, I used a $40 blender. Last year I received my first high-speed blender, a Blendtec. If you plan to make a lot of green smoothies, or smoothies containing hard ingredients (nuts, dates, etc. ), a high-speed blender is the way to go. Yes, high-speed blenders can be pricey and require budgeting over months and years. 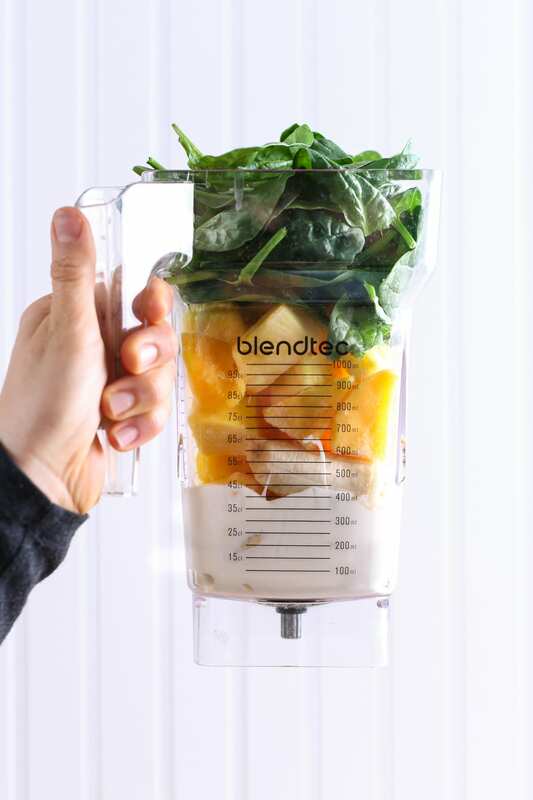 To save money, I highly recommend checking out the Blendtec refurbished site (my blender is a refurb) if that’s the brand you’re looking to purchase. Note: Don’t let the desire or feeling that you need a high-speed blender keep you from prepping smoothies. Any blender will work great for a basic fruit/soft veggie smoothie recipe. My $40 blender lasted 8 years! 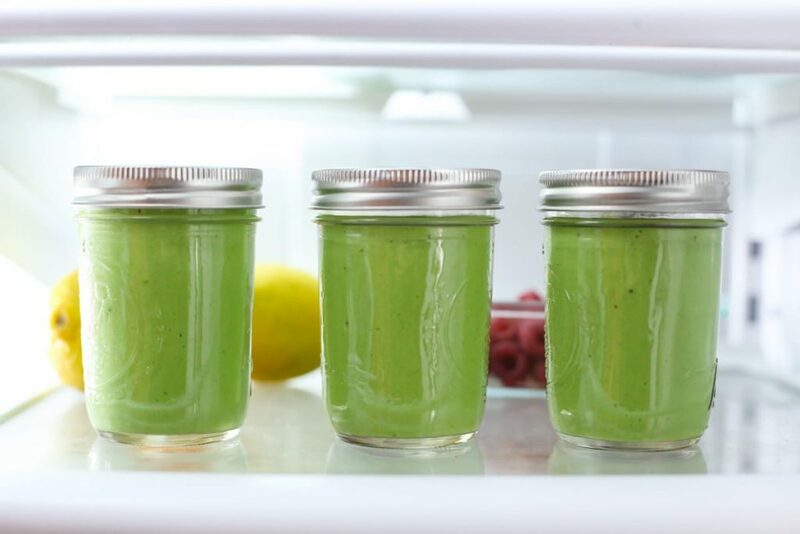 If you have the freezer space and plan to freeze smoothies you’re going to need freezer-safe jars. Freezer-safe Mason jars are my favorite. 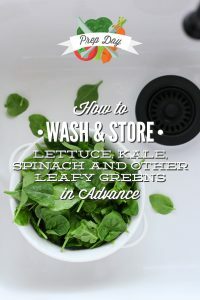 I can use them for soups, smoothies, broth, salad dressing, and so much more. They are also freezer safe thanks to the thick glass and wide mouth. I like to freeze extra smoothies in push-up pop or popsicle molds. Over the years I’ve used both reusable and one-time use molds. Personally, I like the one-time use plastic molds–they are are much better for traveling or the lunchbox since they don’t require washing. Smoothies can also be frozen in popsicle molds. 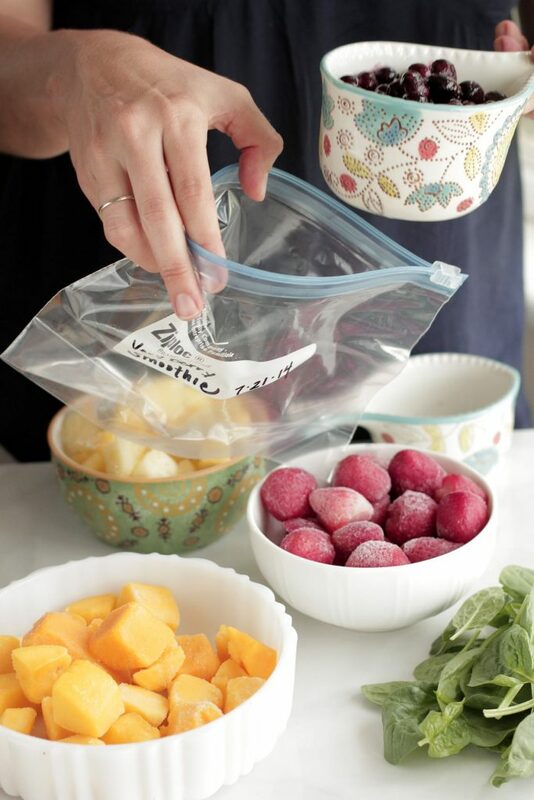 I use plastic Ziploc bags for my DIY freezer smoothie packs. I don’t have a ton of freezer space inside the house (we also have a garage freezer for meat), so the bags work best. If space isn’t a concern and you want to avoid plastic, quart-size Mason jars or freezer-safe containers will also work. 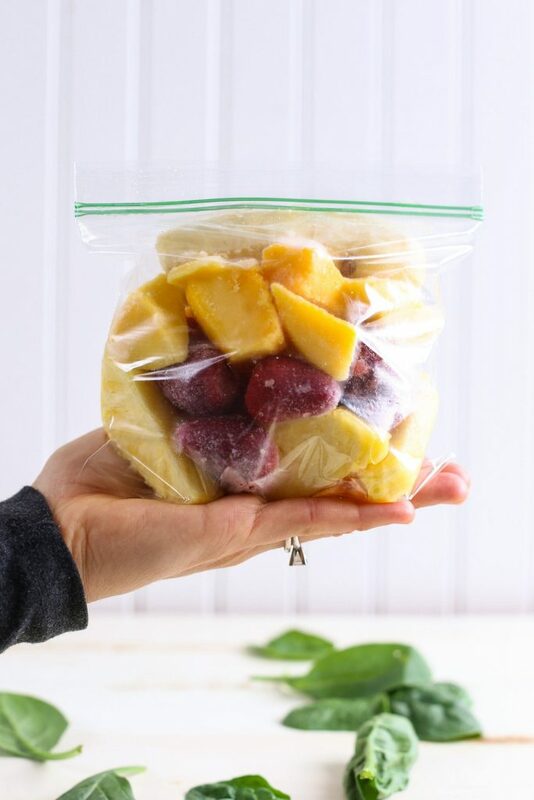 To make a freezer smoothie pack, fill Ziploc bags or Mason jars (if you have the freezer space and want to avoid plastic), with smoothie ingredients. I use this formula: 2 cups fruit, 1 sliced banana (for a creamy consistency and sweetness), 1 cup greens (optional). Freeze the bags or jars. When you desire a smoothie, remove a package from the freezer, place 1 cup of liquid in the blender (or 1/2 cup liquid and 1/2 yogurt). Pour the fruit in the blender, and blend! This option allows you to prep smoothies up to 6 months in advance (about 2-3 months if you’re using greens). 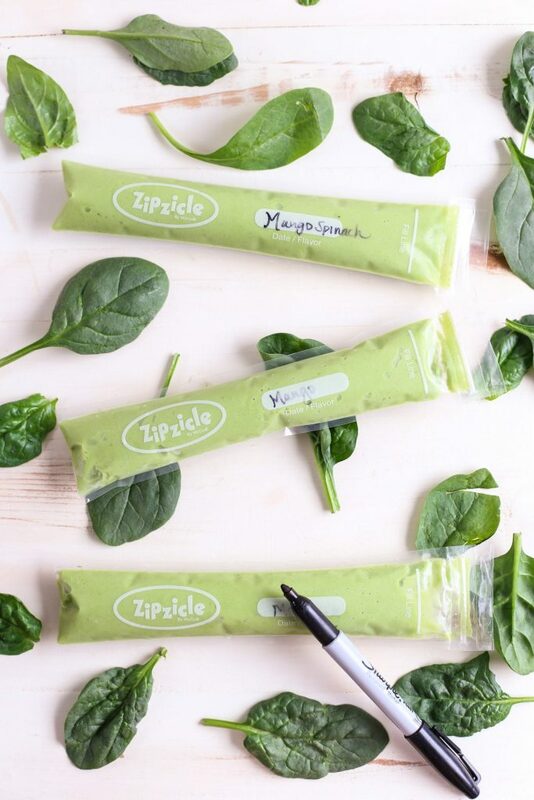 Learn more about freezer smoothie packs. Another make-ahead option is to blend a smoothie in the blender, then pour the smoothie into freezer-safe Mason jars, and freeze. This option requires a bit of planning and freezer space. 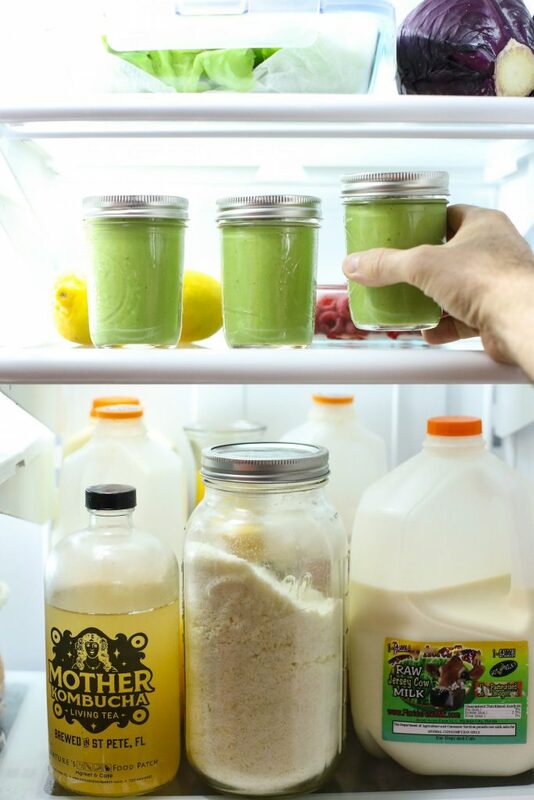 The night before you plan to drink the smoothie, place a smoothie jar in the fridge and defrost overnight. You can also leave the smoothie on the counter for a few hours for a quick defrost. Another option is to place a jar in a lunchbox (don’t forget to add a straw–I like these metal straws). By lunchtime the smoothie will be defrosted and the rest of your lunch will still be cold–thanks to the “ice pack” smoothie! If you’re packing the frozen smoothie in a kid’s lunchbox, I recommend defrosting the smoothie in the fridge overnight, then pouring the smoothie into a thermos. 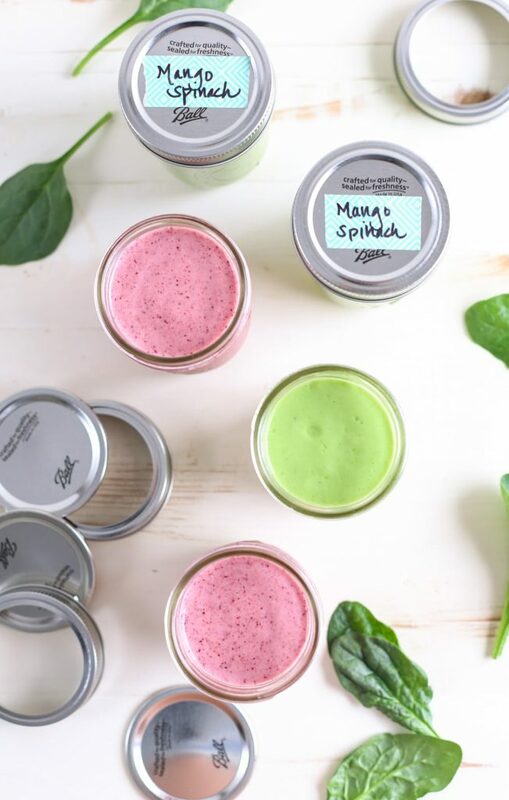 This method allows you prep smoothies up to 3 months in advance! This method is similar to the “Blend and Freeze” method. 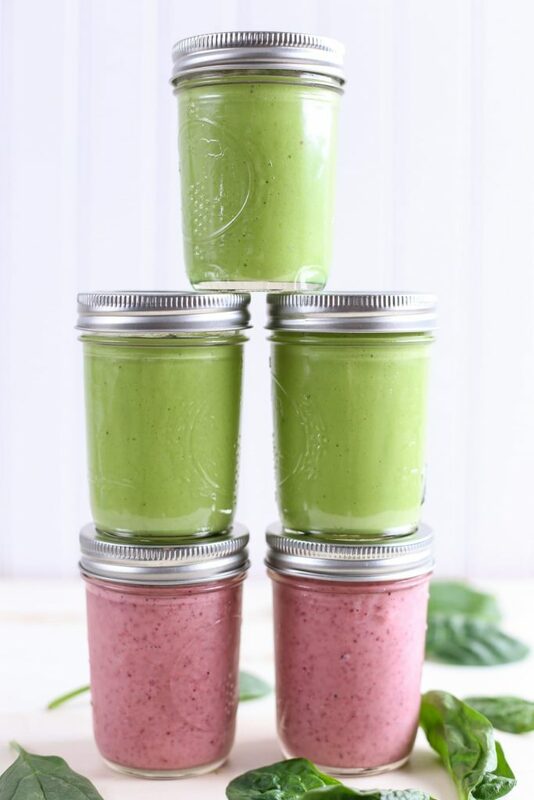 Simply make a smoothie, pour the smoothie into Mason jars (they don’t need to be freezer-safe), and refrigerate. Smoothies will keep in the fridge for 1-2 days. Separation may occur after the first day. This is completely normal. Just stir the smoothie and enjoy! This is my favorite make-ahead smoothie option! On busy mornings or afternoons when my kids need a quick breakfast or snack, I can grab a smoothie from the freezer without the worry of backseat or couch spills. To make grab-n-go smoothies, simply blend a smoothie, and then pour it into push-up molds or even popsicle molds. The push-up molds are great for lunches–simply add them to the lunchbox straight from the freezer. By lunchtime the smoothie is ready to be enjoyed. This week, your homework is to create a meal plan, go shopping for the food you’ll need to implement the meal plan, set aside a specific day/time for prep time, and then print and fill out the Prep Day Action Plan printable. 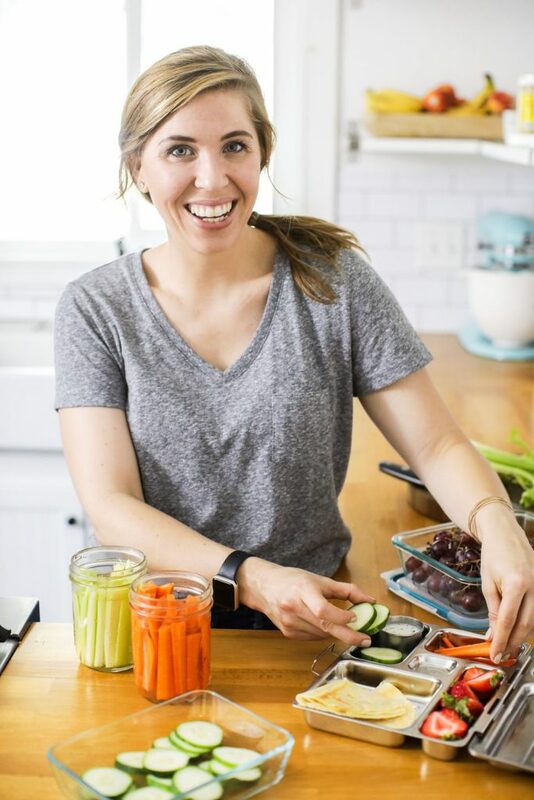 Focus on five foods you can prep this week based on your meal plan and schedule: making soup, cooking and shredding chicken, washing storing greens, prepping muffins/biscuits/pancakes, or making smoothies, etc. Where do you purchase your raw jersey milk? Hey Sheila, The milk comes from a local co-op. The co-op purchases the milk from this farmer: http://www.floridarawmilk.com/. Thanks for the great blog. I was just wondering where you got your beautiful measuring cups that are shown on your smoothie packs picture? Hey Rebecca, Thank you. The measuring cups came from HomeGoods. Where do you buy the zipcicle bags? I was wondering if you can help me with something I am a chef for a high school and I was planning on adding smoothies to my cafeteria menu but my concern is that the life of the smoothie is very short in the fridge. If you where to make a smoothie how long can you leave it in the fridge before you can say “ok now its bad” just so I can make enough and maybe not worry about it until maybe 3 to 4 days after. I was planning on a very simple wild berry with peach and adding a greek yogurt and some milk for consistency if needed. Hey Ace, I personally wouldn’t leave a smoothie in the fridge for longer than two days. I’m not sure the taste or consistency would be very pleasant after that time frame. So I was wondering what is the strategy to fill the the zipzicle zip top freezable pouch… do you have a funnel? Hey Kylee, Yes, a small funnel works well. They aren’t too tricky, but they do require extra attention to pouring :). My Sincere Gratitude to Kristin. Great Information. Precise and Apt. Hope You continue to Enrich more Souls And Simplify Lives. I thought certain food oxidizes quickly, like bananas. If you blend them and leave it in the fridge, they will turn black. Hey Emma, They will turn brown, just like apples. As long as the smoothies are used within a couple of days, they bananas are still good. Great blog! Do you have an smoothie recipe recommendations for the freezer smoothies? I have an extremely picky toddler (and husband lol), I’m trying to sneak healthy in where I can. What size mason jars should I order for my smoothies and should I get wide mouth or regular mouth size? Do you have any experience doing this with protein powder and blending in advance? Looking for a way to get my protein shakes/smoothies ready in advance for work. Hey Jenna, I don’t think it should be an issue to add the powder in advance. In pre-blended smoothies it may thicken the smoothies a bit, but that would be the only issue. TIP: Biotta sells pure beet juice in a bottle. Not cheap, but this adds a nice fruity pink color along with nutrition to cover the army green color that comes from mixing veggies and fruit. For efficiency I make up and refrigerate 6 bottles at a time for myself. They separate, so need shakimg. Otherwise they taste delicious even on Day 6. If I make a strawberry banana smoothie and place it in the freezer, how many days would I have before they aren’t good and I would mak more? I’m really bad about eating breakfast and was hoping to find something I could prep in advance, but I’m not sure how long it will last. Thanks! I was able to look up your question and if you seal it well you can store your smoothie for up to 3 months in the freezer. 24 hours in the fridge. Hi there I have a question. I have been having issues with my smoothies lately. I make them, put them in the freezer (letting the air out too), I take one out and put in the fridge the night before. However when I go to eat it, it is usually a different color and doesn’t taste all that great. I am a meal preparer. I need something quick and on the go in the mornings. These are a perfect idea in theory but don’t taste great. What do you think is going on? Hey Melissa, What are you putting in the smoothies? The ingredients? This will help me troubleshoot what the issue may be. There’s got to be something going on with a particular ingredient, or a combo of ingredients.